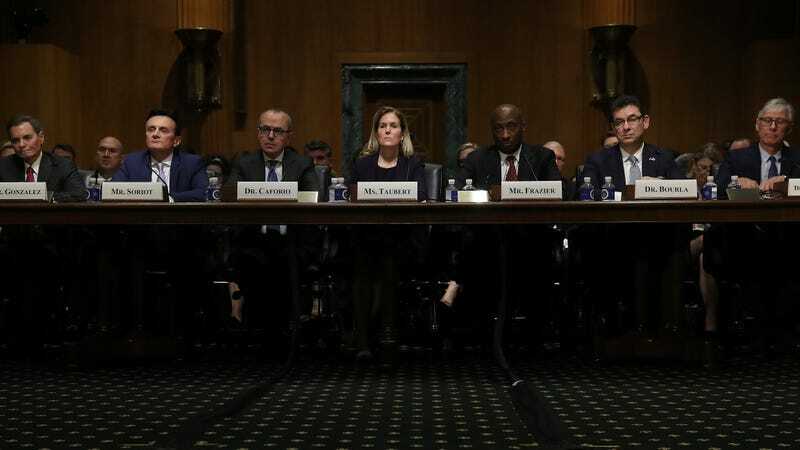 On Tuesday, seven prominent CEOs and leaders of pharmaceutical companies appeared before the Senate Finance Committee at a congressional hearing called to address the industry’s relentless raising of drug prices. Predictably, the CEOs from Bristol-Myers Squibb, Johnson & Johnson, Merck, Pfizer, Sanofi, AbbVie, and AstraZeneca collectively passed the buck, mostly blaming everyone else for the U.S.’s astronomically high drug prices and predicting doom if any major pricing reforms became reality. Here were some of their most absurd talking points. A common refrain by the industry is that it’s been forced to jack up the list price of drugs due to pharmacy benefit managers (PBM), third-party programs that negotiate down prescription drug prices for customers through rebates they obtain from the company. PBMs, CEOs argued during the hearing, are siphoning an ever-larger share of the savings for themselves. They also called for an end to the third-party rebate system in private and public health plans entirely. “The government has to get up and change the rules. And those rebates have to go,” said AstraZeneca CEO Pascal Soriot. Unscrupulous PBMs do share some blame for escalating costs, and lawmakers have proposed bills that would weaken or eliminate them. But they don’t negotiate rebates for all drugs, and collectively, they only take in a small amount of the total money generated by prescription drugs annually—just 4 percent ($23 billion) of $480 billion in 2016, according to an analysis. The drug companies themselves, by the way, take in two-thirds of that total in net revenue, according to that same analysis—a sum of $323 billion in 2016. As committee co-chair Ron Wyden (D-Oregon) noted during the hearing, the companies themselves have the final word in setting prices. In one of the most telling moments of the hearing, the executives were asked by Pat Roberts (R-Kansas) what exactly kept them up at night. While many took the time to wax poetic about doing right by patients, Merck CEO Kenneth Frazier couldn’t resist a little doomsaying. Among the things that kept him up, he said, was the fear that “outrageous solutions” to lowering drug costs demanded by the public would create a future where no new medical breakthroughs could happen again. These outrageous solutions, the CEOs made clear throughout the hearing, included even meager proposals to bring the U.S. a bit closer to its peers in controlling drug prices. The industry, for instance, has aggressively lobbied against a proposal widely praised by policy experts that would set the price of existing drugs under Medicare Part B, which covers drugs given for in-patient, hospital care, to an international price index. Giovanni Caforio, CEO of Bristol-Myers Squibb, criticized the idea during the hearing, while others like Olivier Brandicourt, CEO of Sanofi, went on the record as being against any direct control of costs by the government. “The government should not directly control the price of medicines either through federal government price controls or worse, outsourcing price decision to other countries,” said Brandicourt. Yet when Wyden asked AbbVie CEO Richard Gonzalez if AbbVie was still profitable in places with strict price controls such as Germany, Gonzalez was forced to admit that they are indeed profitable in every industrialized country. Gonzalez then tried to argue that if the U.S. ever did get drug prices to those levels, the company’s investment in R&D would be lower; Wyden countered correctly that AbbVie’s U.S. revenue alone is higher than what it spends in research globally annually. The CEOs’ attempts to spin reality were often baffling, but none so much as when they pointed the finger at Medicare; they even (inadvertently) helped make the case for Medicare for All. Repeatedly, the CEOs took aim at Medicare Part D for the high prices paid by patients, since its model requires patients on average to cover 13 percent of their drug costs out-of-pocket, as opposed to 3 percent of hospital costs. Many, like Jennifer Taubert, the executive vice president and worldwide chairman of Johnson & Johnson’s pharma division, Janssen Pharmaceuticals, called for a hard limit on out-of-pocket costs that can be paid by Medicare patients, or for the government to make it easier for companies to offer rebates directly to these patients. “While Medicare Part D is working for many seniors and has been effective in containing costs, we believe an out-of-pocket cap in Medicare Part D is a needed protection,” Taubert said in her opening statement. Medicare plans should absolutely cover a greater percentage of drug costs, and it’s an idea that’s begun to receive some support in Congress. But it’s also plainly true that if a drug’s list price set by a company was lowered, out-of-pocket costs for that drug would drop too, no matter how big the slice of the pie currently paid by the government or private insurer is. The lack of an out-of-pocket cap for Medicare Part D is a flaw that’s been worsened by ever-rising list prices, but it’s not responsible for the pricing crisis. It’s also true that growing deductibles, co-payments, and other forms of cost-sharing have helped increase the out-of-pocket costs people have to pay alongside higher drug prices. But advocates of a single-payer system often argue that their plan—by cutting out the private insurance industry from essential health coverage, greatly reducing administrative costs, and giving the government the ability to broadly drive down drug prices as other countries do—would save the average American money while still being able to reduce or completely end cost-sharing (and obviously providing coverage to millions more people). And more than one study, from both conservative- and progressive-leaning sources, has suggested they’re completely right. In other words, if Big Pharma is really upset that Medicare patients are being forced to pay more out-of-pocket money for their drugs, they should go ahead and endorse Medicare for All. But something tells me that they won’t.